Leather is a versatile material used for clothing, shoes, accessories, furniture and many other items. Condensation from a drinking glass can form a water stain on leather once the water dries. Water dries the leather's natural oils, causing the leather to become dehydrated. In order to remove water stains from leather, simply wipe the leather with a dry cloth. 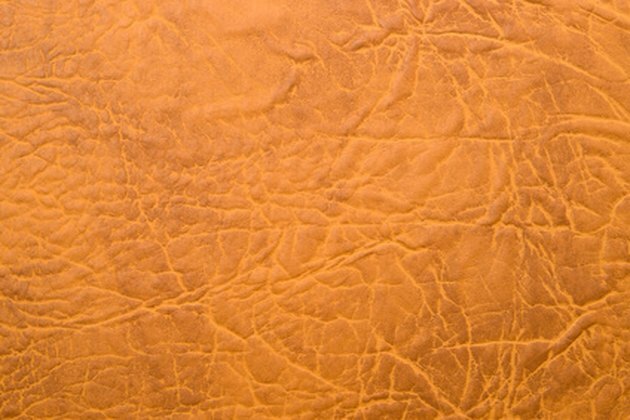 Water stains can easily be removed from leather. Fill a bowl with water at room temperature. Soak a sponge in the water, then squeeze the sponge to remove as much water as possible. Wipe the stain with the sponge, working from the center of the stain outward. Apply just enough water to dampen the stain. Do not soak the leather. Continue wiping the stain with the sponge until the stain is removed. Wipe the entire surface of the leather with the damp sponge to allow the leather to dry uniformly. Wipe the leather with a dry cloth, then apply leather conditioner to a soft cloth. There is no limit to how much conditioner to apply, as the natural oils in the conditioner will saturate the leather. Rub the cloth over the entire leather surface to message the conditioner into the leather. Allow the conditioner to set on the leather for 20 minutes before using the leather item.